Seacoast United’s NPSL and WPSL seasons also commence this weekend. 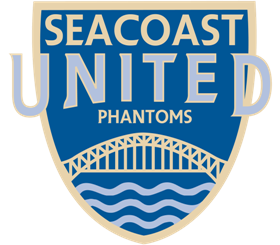 Seacoast United Phantoms NPSL are under new leadership with Alex Ryan as head coach, who previously was a standout on the Phantoms PDL team. They face Greater Lowell NPSL FC away this Saturday 6pm at Tyngsboro HS as they look to start their season on a high. The Phantoms NPSL team’s first home game is on Sunday May 21st at 4pm against Elm City Express. Seacoast United Phantoms WPSL, led by coach Rob Thompson in his second season, kick off their season with a home game on Mother’s Day - Sunday May 14th against the Rhode Island Reds. Kickoff is scheduled for 6pm at Seacoast United Sports Park where all mothers receive free admission. All Phantoms home games will be held at Seacoast United Sports Park in Amesbury, MA, complete with a beautiful new turf field. Game day experience is complemented with the Crossbar Pub family-friendly vibe and panoramic views of the field. A full list of all minor league home games can be found at www.seacoastunited.com/phantoms.